Congratulations to our young sportsmen and women. 5-a-side Wicklow winners and runners up. 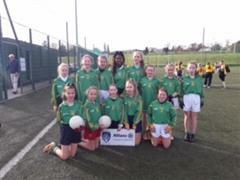 Despite a frosty start to the day Bray Emmets drew a large crowd for the 5th and 6th class girls participation day. The pupils who completed their speech and drama grade exams 2017.